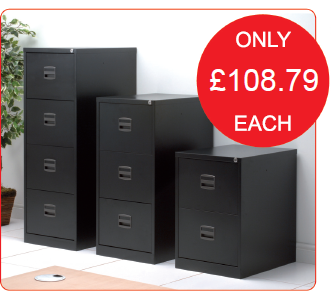 4 Drawer Filing Cabinets by Bisley from only £129+vat ! and all those files and papers need to be put somewhere safe. Steel filing cabinets and cupboards are ideal for neatly storing all that paperwork that you still need to have access to and at prices starting from £109+vat it really is a low cost solution. Delivery is FREE to our local area of the Forest of Dean, Gloucester, Cheltenham, Ross on Wye, Monmouth and Chepstow and for the rest of the UK there is a small delivery charge. Please contact one of our friendly, knowledgeable team on 01594 810081 for further information or to place an order.